David moved to the Broad River watershed in 1987 after receiving an Engineering degree from Clemson University. 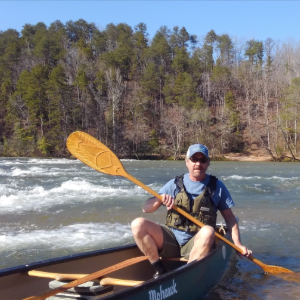 He worked in manufacturing for several years in Shelby, and has been fishing, paddling, and exploring the watershed’s rivers and tributaries for over three decades now. David’s first civic involvement was in the late 90’s, when he joined efforts to rebuild and restore the carousel in Shelby City Park. The carousel is now a jewel of the City of Shelby Parks system. Since 2000, David has also run a woodworking business at his home in Lawndale. In 2015, David became the Coordinator for the Broad River Alliance, a Waterkeeper Affiliate and program of MountainTrue. David has teamed up with regional representatives from the Broad River Greenway, Rutherford Outdoor Coalition, Rutherford County and Cleveland County Development Authorities and others to protect and promote the waters of the Broad River basin.